Resolution capability of an optical imaging system can be enhanced by reducing width of central lobe of the point spread function (PSF) of the transverse intensity distribution on the far field plane. Attempts to achieve the same by pupil plane filtering, is usually accompanied by concomitant increase in side lobe intensity. The mutual exclusivity between these two objectives may be cast as a multi objective optimization problem that does not have a unique solution; rather a class of trade off solutions called Pareto optimal solutions may be generated. To achieve super resolution, lossless phase only filters with pre-specified lower limits for Strehl ratio are synthesized by using Particle Swarm Optimization technique. Practical validation of the theoretical results is also undertaken by realizing the phase filters on reflective, phase only liquid crystal on silicon spatial light modulator. 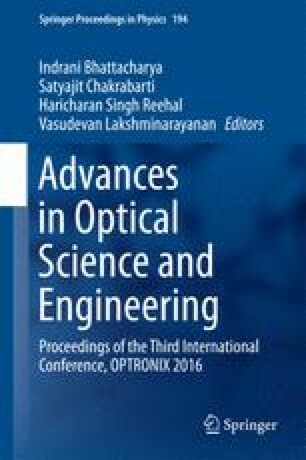 This work has been supported by the INSPIRE Fellow program for Somparna Mukhopadhyay under the scheme of “Assured Opportunity for Research Career” (AORC)/2010  by the Department of Science & Technology (DST), India.